Habits are hard to break, I guess that's why poor brands such as Burtons and Wh Smith have survived so long. I do fear that two of my old fashion habits, Warehouse and Oasis might be on their way out. At the moment, aside from concessions there are NO Oasis stores in the centre of Leeds AT ALL. Warehouse looks like it's on its last legs and the online stores for both are full of recycled sale stock. There doesn't seem to be much sense of doing what's right for the customer, more of a, let's fleece the customer for all they've got while we still can, type philosophy. Thing is, because brands like that have been around for such a long time, its mugs like me who keep them going. Having said that, you cannot argue with these two sales bargains that I admit I have ordered, first of all these zip hem trousers at £12, gets a good review and for that money it's difficult to argue, after all everyone needs black trousers don't they? 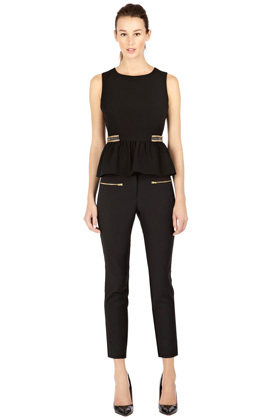 I've been looking for some reasonably priced, everyday work wear trousers since September and have spotted these Zip Detail Trousers for £15 (plenty of sizes left) which I have also ordered! I'm hoping they are going to fit beautifully and go with EVERYTHING. However, so many times when ordering online I've been disappointed, so I'm not going to get my hopes up too much. 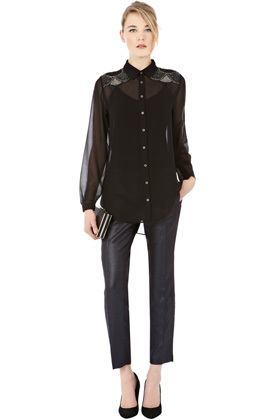 I've been searching and searching for months now for the PERFECT shirt. I thought I was going to find it in Karen Millen, until I realised that all their shirts are dry clean only, that was never going to work for me, the shirt would end up owning me rather than the other way around. Anyway, on a chance I decided to order this sheer shirt from Warehouse, it's well discounted at £25 from £70 and I'm hoping it will be decent quality. However there is a little voice in my head saying, "it's a bit young for you", and I actually have no idea what I'm going to wear it with, any tips? Oh and there's only an 8 left, and I'm a 10, so it seems doomed from the start. However to ease the blow there's a 15% off code SSNEW15. Still talking about shirts, I've become fully acquainted with the Hobbs website, though annoyingly at this late stage most sizes are sold out, I need to be quicker off the ball next time. 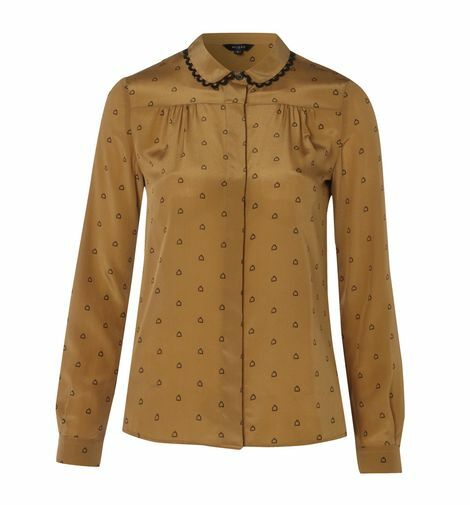 Anyway, if you are a size 14, this is a complete bargain at £49, the stirrup blouse, great tucker into skinny jeans or a black pencil skirt. 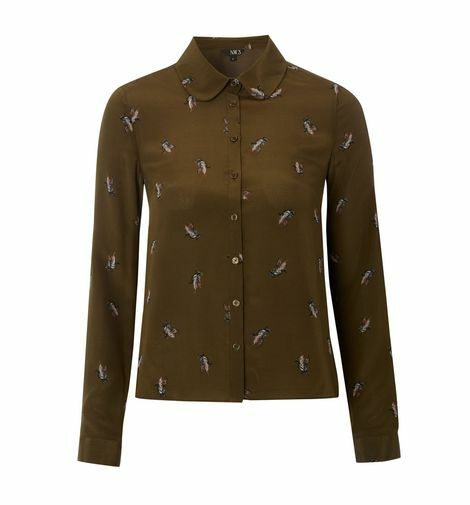 I'm completely in love with this Mr Duck shirt, at £69, though there are only size 6s left, a bit optimistic, but maybe they have them in stores, who knows? Oh, and while I remember, I normally don't like Boden, as I think the emphasis is not on slimming (a very important word when it comes to clothes) but I'm sick of getting up in the morning and not having anything to"throw on". Indeed, I recently had a very therapeutic wardrobe cleaning out session where I eliminated anything that wasn't flattering. Unfortunately flattering and tight fitting also go together, as does uncomfortable, so now I find myself in the unenviable position of not having anything completely comfortable in my wardrobe. 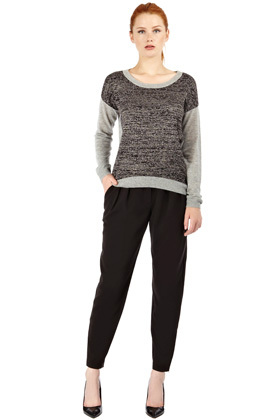 Anyway, this was a bit of a bargain and looks like something I could wear with any trousers, or even a nice A line skirt, this casual stripe jumper for £11.70 (the website won't let me copy images sorry!). There's also a free delivery code Q235. Have you found any last minute sale bargains this year?